Will’s evaluation with his school has been completed and he has been placed on an individualized education plan, IEP. We are very pleased with the results and the way the school is looking out for Will. 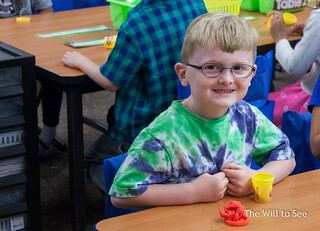 During the evaluation process he was visited by Krista, his vision specialist, in his classroom. She observed him in the class and also worked with him one on one. Through this evaluation she determined that he needed help advocating for himself and learning to use vision aid tools. It is great that he is on an IEP, because we have Krista as a part of our team. Krista will be working with Will on these skills and we will get goal updates periodically to keep up with his progress. Along with the specialized instruction Will also will get classroom and testing accommodations. He has a monitor to help him view the active board (an interactive white board in each classroom at our school) and the document viewer. He can move to that desk whenever he needs help seeing the board and can make the screen larger as needed. He is also learning to use magnifiers to help enlarge books or worksheets that can’t be blown up, and also an iPad for viewing things around the room. And he gets preferential seating near the teacher during story time and at library. For testing, Will gets large print tests and can mark his answers anyway he likes, he doesn’t have to fill the bubble in. His tests are transcribed once he is done. Eventually when tests are timed he will get unlimited time. He is doing really well in school and is excited every day. We are so proud of him and can’t wait to watch him grow this year. And all of this is due, in part, to the wonderful support we are currently getting from the team at school. We are very fortunate to live in an area with such and acclaimed school district. Love your site and this piece. My husband (38) has OA and drives, plays sports etc. I am grateful for increasingly accessible experiences everywhere we go! Lots of room to grow, but your kids will grow up in an increasingly accessible world. Great blog!